How to Get Even 5x more from Remarketing on Facebook! TL;DR An average 15-20 % of users bounce from websites in the first 10 seconds because they came from non-quality sources (miss clicks, referrals, etc). Unfortunately, standard re-marketing also targets these low-quality leads. This causes users to become even more annoyed resulting in negative feedback and punishment in Facebook's auction. What’s worse is that you end up paying for impressions that neither you nor your users want. 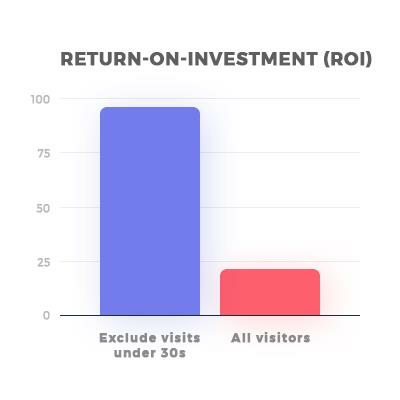 In this article, we will show you how you can automatically exclude bounce traffic to solve this issue and boost your ROI up to 5x! When you finally attract users to your web page, you only have 10 seconds to communicate your value proposition before they leave. Even with that, most visitors do not stay more than 1 minute on a web page. A study reported by the Nielsen Norman group explains why this is with the phenomenon known as negative aging. 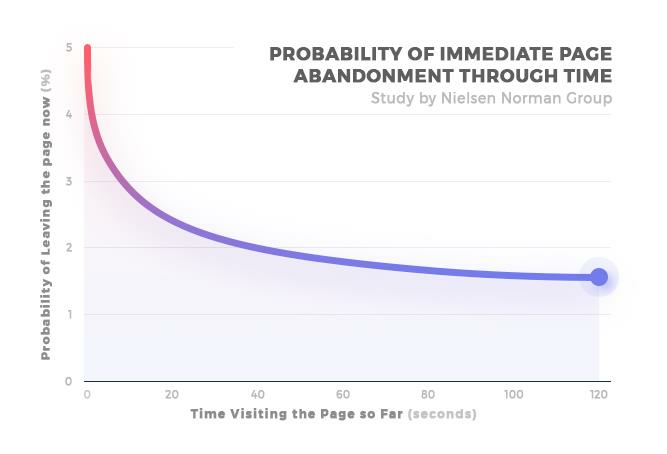 In a nutshell, it explains that the longer a person stays on the page the probability of them leaving will decrease over time. Or we can put it this way. If you have read to this point, then there is a less than 2% probability of you leaving this page now. This is hopefully because you can find value in what you read. Visitors to any site want to know as quickly as possible if the page they visited answers a question, fills a need and more. If a page is designed well then the likelihood of staying on the page also increases. Once you can surpass this harsh scrutiny then visitors are likely to stay longer. 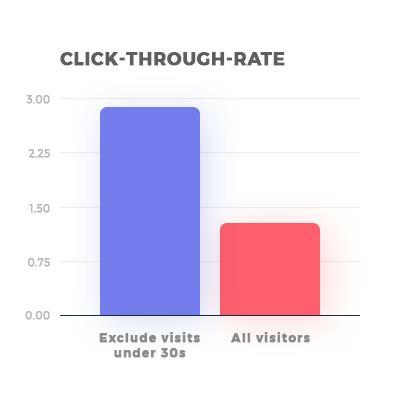 What we can learn from this is that when re-targeting users who visited your site, exclude those who spent less between 5-10 seconds on your site. This figure will depend on the type content/ products you have. High-involvement products, for example, might require more time to asses than low-involvement products. 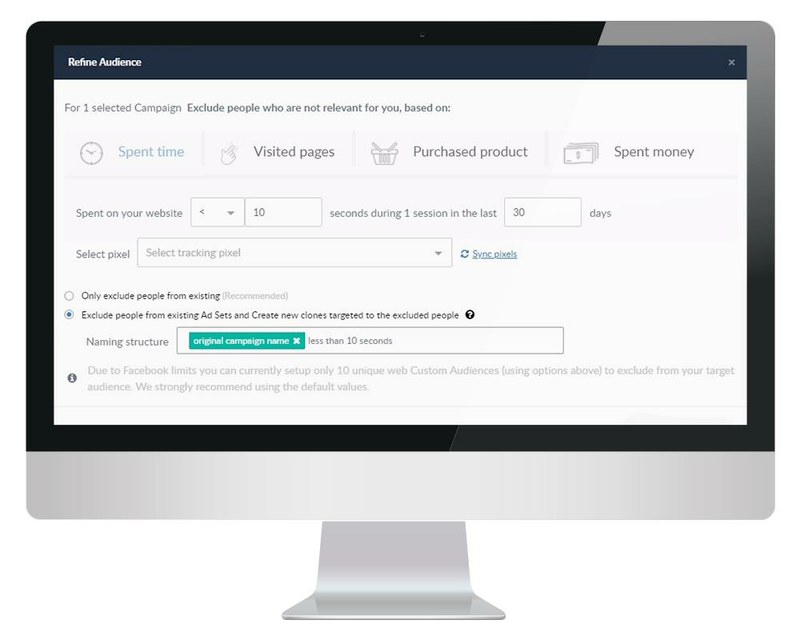 Select marketing campaigns and ad sets. Choose the length of time spent that you consider to be bounce traffic. Update audiences and slice them into different ad sets so that they are not lost to you. 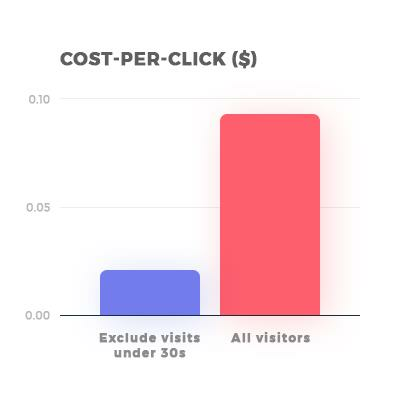 In each of these examples, you limit serving your ads and spending your budget on those who are less likely to take a positive act towards your goal. And this has shown some astounding results. So far we have managed to lower CPC by 66% simply by lowering excluding visits under 30 seconds. The CTR for this same exclusion increased over 2 fold. What is even more surprising is that the ROI increased from 21 to 97. With the refining audience tool, you are in control. You can decide which visitors constitutes as relevant audience for your needs. This will ensure that you save money as you optimize your spend to reach your goals. If you would like to try refining your audiences, simply log in to the ROI Hunter platform to get started. Unfortunately, the option of refining your audience based on exact time spent on page is not possible with Facebook’s native advertising tools. This is why we created the refining tool.